One of my early clients tragically lost her dog. He was a sweet boy. Very responsive, a dream to work with and the owner did her work. We had discussed safety, using leashes on walks, etc. over our sessions. She liked to have her dogs off leash when she hiked. Well I used to hike with my dogs, off leash, specific areas where it was allowed at the time, and my dogs had a lot of training, proofing and testing. Even at that, often my dogs were on leash. That was also over twenty years ago and I have changed my views a lot since then about general safety. You see, I knew my dogs’ limits but I cannot control other elements such as oh… Other loose animals. So now, I keep my dogs on leash unless it is a competition requiring off leash work. One weekend this owner took her dog hiking and decided to let him off leash. Rufus was a young guy – not even a year old. He had just begun training. He was far from ready for any off leash work. As luck would have it, Rufus saw something. He took off in the direction of a parking lot and access road. No amount of calling got him to return. At that moment, another vehicle pulled into the lot. Rufus was killed. I was called, and I have mentioned this case in other writings, to evaluate some larger dogs that killed a smaller dog. Well the smaller dog was off leash and ran underneath the leashed larger dogs. The smaller dog nipped and challenged the larger dogs. The larger dogs responded. Sadly the lawyer for the owner of the smaller dog kept interfering with my ability to get into see the dogs (I had to do the evaluation on a weekend due to the distance away and the lawyer refused to work on a weekend.) Had the smaller dog been leashed, he never would have gone after the larger dogs. I see many off leash dogs in my area. Some are walking with owners while some are allowed to roam front lawns and the bordering properties. I have watched a couple wander into the street while owners are watching. All it takes is one incident that could have been prevented with a leash for your dog to be gone. Another loose dog, a leashed dog your dog goes after, a child races up to pat the dog and is bitten, a squirrel… Is it worth the risk to assume you can 100% trust your pet off the leash? There are too many cases where a dog is fully entrusted with a child and tragedy happens. No matter what you are told, there is no real “Nanny dog” nor any breed developed to instinctively protect children. In my research of hundreds of breeds, not one breed was developed for the sole purpose of caring for your child. Even breeds developed for protecting hearth and home, livestock and residents needs their inherent behaviors honed. This still does not mean the dog will be 100% tolerant of anything your child will do. With memes and posts on social media, it is easy to see how people may be lead to think that XYZ will be the “perfect” caretaker for your child. Then you see the stories: bites, mauling and fatalities by a family dog. I see many dangerous things children are allowed to do that dogs are expected to tolerate. It is frightening. I have seen dogs expected to allow children to climb all over them, poke, hit, annoy the dogs while eating, etc. Just because you think a dog should allow a child to do anything because of what you were told about the type, dogs in general, or your own assumptions, is not reality. Eventually even the most tolerant dog can feel he has no other recourse than to stop the problem – his way. Now owners are shocked when a bite happens. We should not be shocked. These are dogs: not babysitters or toys. They are living, thinking, responding animals. Chances are the dog gave warning long before the bite. Is it worth the risk to assume 100% of the time your dog will never respond? I trust my dogs 100% to be dogs. I trust they will do dog things. They will do things others find gross. They may steal food if left unattended where they can get it. They will chase squirrels. They will growl when something is wrong or when playing. If pushed too far, they may nip. They are dogs. My job is to have them build trust in me so they feel comfortable letting me know what is going on. My job is not to trust but to work to increase safety for my dogs and the community. This means leashes, observation, recognizing situations that could set them up to fail and not demanding them to tolerate unfair treatment. My duty to my dogs is to remember they are a different species with different communication and behaviors trying to exist in my life. I can only trust that I will do all I can to make this a good relationship. Trust is NOT a bad thing. It is how we apply our trust and our expectations that determine how situation may play out. Karen Peak is the owner of West Wind Dog Training in Virginia and the developer of The Safe Kids/Safe Dogs Project – started in 2000. OLD DOGS, NEW TRICKS: A pet doesn’t have to come from a breeder to be properly trained. Conditioning a dog out of a shelter and into a home is part of its domestication. What inspired you to work with rescue dogs? Brandon McMillan: I trained animals for film and television for 15 years. During that time I worked at a company that had very old-school thinking, where you always go to breeders for dogs — not rescues. We had just lost our Rottweiler and were in the market for another one. I convinced the owner of the company to let me go to the shelter and rescue a Rottie instead of going to a breeder. There was a lot of pushback with that thinking but eventually, after about 20 arguments, he let me do it on one contingency: My job would be on the line if I were wrong.The next day I went down to the shelter and found a 1-year-old Rottie named Raven. After a few months of training she was sent out on her first job and she knocked it out of the park. In fact, she became one of our best working dogs. Proving it wasn’t a fluke, I rescued a dozen or so more over the next few years till eventually our entire pack was rescues — and they were some of the best working dogs in the industry. It’s safe to say I got to keep my job after that. A NEW SHELTER: McMillan attests that when a dog has been saved from a shelter, they know they’ve been rescued and he’s happy to be a part of the healing process. What is the biggest benefit to rescuing a shelter dog? I can attest from rescuing hundreds of dogs over the years that they know when they’ve been saved. When a dog is suddenly thrown into a small concrete block cell with jail bars as a front door, it affects them big-time. The longer they spend in that cell, the more it affects them, eventually altering their personality. When you rescue them from a situation like this now you’re starting the healing process of what they just went through. Time will heal them, and it all starts with a new home. It’s a win-win for both. What is the most challenging part of training dogs? No two are alike. Dogs are like a thumbprint, so the method that might work on this dog doesn’t necessarily work on the next dog. It’s almost like solving a riddle every time. I usually have a game plan when I work with a dog, but that game plan is only good if the dog goes along with the entire plan. Most likely, there will be some pushback on their end and I’ll need to instantly change the game plan without pausing for even a second. I need to have a plan B, C and D already lined up, knowing that there’s a good chance this animal won’t learn off plan A. That’s what I love about it: the challenge. I like that it’s often not easy, because if it were easy, everyone would do it. You’ve worked with many wild animals in the past. What has been your favorite? I like working with them all because they all require different methods. Big cats are very fast so I have to make quick decisions when training them. Primates think a lot like us so it’s a chess game when I work with them. Bears, believe it or not, are just like working a dog. They’re very intelligent and very trainable and they love to learn new things. But if I have to pick a favorite I’m going to have to go with the great whites. Not that I can train them or anything, but I’ve dived with them for years and find them to be one of the most fascinating creatures this planet has ever produced. I host a Shark Week show on Discovery every year about great whites, which has allowed me to not only work face to face with them but also study their behavior. What I’ve come to realize is they’re not as scary as people think. I feel the most at peace when I’m face to face with an 18-foot great white. APPROPRIATE EMBRACE: Adopting and rescuing a dog is a great thing to do, but McMillan advises that the pup you choose suits both your lifestyle and theirs. What is your favorite aspect of being a trainer? My job is to teach an animal everything it needs to possibly know living in the domestic world. We as humans set rules for our dogs and the dogs are taught to follow our rules and guidelines. I took a lot of different forms of martial arts for a lot of years. What I noticed with every instructor I was a student under was their passion was teaching us everything they knew — from the details of the technique to the muscle memory, locking it into our bodies forever so we’d never forget it. That’s the same rule I live by as an animal trainer. I’m a technician that educates animals. It’s a rare craft and I absolutely love doing it. What advice would you give our readers who are thinking of adopting a dog? Be sure the dog is adequate for your lifestyle. Don’t just adopt off aesthetics alone. Sure, we all have an idea of the look we’re going for. But make sure that dog is the right size for your home. Make sure their personality complements your lifestyle. Make sure their energy level is right for yours and most importantly make sure you have time for a dog. I always tell people to take your time, don’t make any impulse decisions you might regret a week later because you didn’t think all of this through. That’s the number one reason dogs are returned to the shelters — because people adopted them on an impulse decision, not thinking everything through. The first few weeks you and your new dog spend together will shape your future relationship and forge the lifelong bond between you. To make the most of these crucially important first days and weeks, it’s very smart to do some advance planning, including the following steps. Taking excellent care of a pet requires time, energy, and commitment. To avoid either neglecting the new dog, or battles over who didn’t do what to care for him, it’s best to set everyone’s expectations ahead of time. Before your new pet arrives, sit down with all members of your household to discuss the many details involved in becoming dog guardians. For example, decide what family members will be responsible for which pet care chores. Often, children ask for a pet and their parents oblige without realizing a child’s desire for a pet doesn’t always translate to a desire to take care of a pet. Also, children need help to learn how to care for a pet properly. Even the adults in the family, if chores aren’t assigned ahead of time, can assume it’s the responsibility of someone other than them to, for example, pick up the dog poop from the backyard. If everyone in the house leaves for work or school every day, who will come in and care for the puppy? Who’s on potty walk duty? How about when your new furry family member needs to go out in the middle of the night? Who will take him for his veterinary wellness exams? Who will be taking care of trimming nails, dental care, and brushing and bathing the dog? Where will your new dog eat her meals? Where will her bowls of fresh water be placed? Where will she sleep – in your bedroom? Will she sleep with you or in her own bed? Will the dog be gated off from certain parts of the house? If so, how? If you plan to crate train, where will you keep it? I’m an advocate of crate training, especially for puppies, but also adult dogs. If you haven’t already, take a look at my videos on crate training, which offer a step-by-step guide to getting your dog used to his crate. I consider crating a very important part of keeping your dog safe when you’re not at home or can’t keep a constant eye on him. If you’re uncomfortable with the idea of a crate, keep in mind that dogs, by nature, are den animals. They crave being in a small, safe, dark spot. Have the crate ready when your pet comes home. If he’s allowed to sleep in your bed with you for several days and then you move him to a crate, he’ll likely have a more difficult time adjusting. This is because your dog will have learned his nighttime sleeping spot is your bed. I recommend purchasing all necessary pet supplies before you bring your new dog home. This includes a leash, collar or harness, non-toxic food and water bowls, ID tag, toys, biodegradable potty bags, non-toxic bed, crate – everything you’ll need to be well-equipped when the new addition arrives. I also strongly recommend you keep your dog on the same food she’s been eating, even if it’s poor quality, as you transition to a healthier type of food. Your home may be a blessed improvement over what your dog been used to, but her body will still interpret this wonderful change in circumstances as stressful. Change, whether good or bad, gets translated as stress in your pet’s body. Puppies, in particular, experience a lot of stress because they’re being separated from their mom and littermates for the first time. They’re also changing environments – often both indoor and outdoor environments – which can bring new allergens that affect their immune system. Your new dog has a brand new family of humans and often other four-legged members as well. The last thing her body needs right now is a brand new diet that might cause tummy problems. That’s why I recommend you continue to feed whatever diet your pet is currently eating, and then slowly wean her onto a better quality diet after she settles in. This is definitely something you’ll want to do before bringing your new dog home with you. You might not think of everything you need to do right off the bat, but at a minimum, you should move cords out of reach, plus plants and other hazardous temptations. If you’re bringing home a puppy, you’ll have a built-in incentive for keeping a neat, clean house, because if it’s been lost or left behind, puppy will find it! Pet-proofing your home before your new canine companion arrives is the best way to prevent choking, vomiting, diarrhea or another crisis during those important first few weeks. If your dog will be in your yard off-leash, you’ll want to insure there’s no way he can escape. You’ll also want to avoid using herbicides or pesticides, make sure there are no potentially toxic plants growing, and clear away any brush and debris that could harbor pests during the warmer months of the year. Whether your new canine companion is a puppy or an adult dog, you’ll want to get her socialization underway as soon as you bring her home, along with basic obedience training. The best time to start puppy play groups is at 8 weeks of age, then moving on to puppy kindergarten, beginning, intermediate and advanced obedience classes. These are essential elements in raising a well-balanced dog. What I tell new dog parents is if you bring home a dog but don’t plan to socialize or educate her properly, it’s a lot like having a child and deciding not to allow her to make friends, have adventures, or attend school. And starting puppy class at 6 months of age is like beginning to parent your child on her 14th birthday; there will be some behaviors that will be hard to correct. Puppies and dogs are educated about the world through socialization early on with other people, dogs, cats, and environments outside their houses. Dogs that don’t get out of their home environment long before 6 months of age often wind up with developmental or social difficulties later in life. There’s a period of time in every puppy’s life, typically from 6 to 12 weeks of age, during which mental and social development is most achievable. If your pet isn’t socialized during that time, it can set the stage for problems years down the road. If you adopted your dog from a shelter or rescue organization, she may have some behavior problems, fears, or lack basic training. Many dogs abandoned to shelters weren’t given the best care, and staying in a shelter environment for any length of time can also have an effect on an animal’s behavior. Because your dog may come to you with emotional or behavioral baggage, you should be prepared to put in the time and effort required to help her succeed in her new life with you. Behavior modification using a positive reward system is the key to encouraging good behavior. You may be able to accomplish this on your own, or you may need the help of a veterinarian or an animal behavior specialist. Most importantly, you may correct one training issue only to find another fear or phobia pop up 4 months later; hang in there with positive behavior modification until you see the desired results. There’s a wonderful program I recommend to all new parents of adopted or rescued pets that helps dogs adjust to a new home in the least stressful manner. You can find it at A Sound Beginning, and you can immediately begin using the book’s tips and tricks and the calming music CD on your dog’s first day home. I always recommend that dog guardians take at least a few days off from work – preferably a week – to properly welcome a new pet home. It will take some time for your puppy or dog to get acclimated to his new environment and into a consistent daily routine. If you’re gone from home for several hours most days, I also recommend arranging for a regular dog walker or doggy daycare a few days a week. Most dogs have difficulty spending hours alone every day with no one around and nothing to do. This goes double for new canine family members, and triple for dogs who have just come from a shelter environment. The more time you’re able to spend with your new canine companion giving him lots of positive attention and teaching him the rules and routines in his new home and life, the better the outcome for both of you. In the above scenario, or one in which your pet is being approached by an aggressive dog, it is nearly impossible to get control of the situation if the need arises. It’s much easier to regain control of – or protect — a dog at the end of a six-foot standard flat leash than it is if he’s 20 or so feet away at the end of what amounts to a thin string. The thin cord of a retractable leash can break – especially when a powerful dog is on the other end of it. If a strong, good-sized dog takes off at full speed, the cord can snap. Not only can that put the dog and whatever he may be chasing in danger, but also the cord can snap back and injure the human at the other end. If a dog walker gets tangled up in the cord of a retractable leash, or grabs it in an attempt to reel in their dog, it can result in burns, cuts, and even amputation. In addition, many people have been pulled right off their feet by a dog that reaches the end of the leash and keeps going. This can result in bruises, “road rash,” broken bones, and worse. 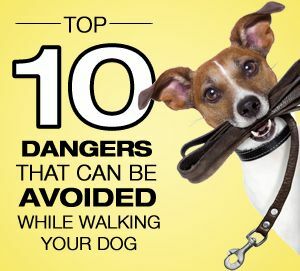 Along those same lines, many dogs – especially fearful ones – are terrorized by the sound of a dropped retractable leash handle and may take off running, which is dangerous enough. To make matters worse, the object of the poor dog’s fear is then “chasing” her, and if the leash is retracting as she runs, the handle is gaining ground on her – she can’t escape it. Even if this scenario ultimately ends without physical harm to the dog (or anyone else), it can create lingering fear in the dog not only of leashes, but also of being walked. Retractable leashes are an especially bad idea for dogs that haven’t been trained to walk politely on a regular leash. By their very nature, retractables train dogs to pull while on leash, because they learn that pulling extends the lead. Raising a good canine citizen doesn’t come naturally to every dog guardian, which is one of the reasons so many unlucky pups are relinquished to animal shelters each year. Many people don’t realize that molding a puppy or adopted adult dog into a balanced canine companion requires a considerable investment of time and energy. And while everyone recognizes the difference between a well-mannered dog and one that is unpredictable and out-of-control, often dog owners develop bad habits without realizing it, and are left feeling confused and frustrated with their dog’s uncooperative behavior. Every interaction with your pet sends a message, and sometimes dog owners inadvertently send the wrong ones. For example, giving your pup attention or affection when she’s performing an undesirable behavior can reinforce that behavior, increasing the likelihood she’ll continue to do it. Your dog is: Canis lupus. You are: Homo sapiens. You and your dog are different species. Put another way, your dog is not a human. And treating her as if she is will deprive her of many things that can make her healthy and happy. She doesn’t need that processed pet food, no matter how cute you think the TV ad is. She needs balanced, carnivore-appropriate nutrition. She doesn’t really need another stuffed toy or rain boots, but she does need at least 20 minutes of aerobic exercise every day. Okay, it’s a silly play on words, but seriously… two hygiene items every pet parent should but often doesn’t attend to are their dog’s teeth and nails. You should brush your dog’s teeth if not every day, at least several times a week. Otherwise, like most dogs over the age of 3, he’ll have gum disease, and as time passes the situation will worsen until his mouth smells bad and feels worse. Then you’ll be faced with a big vet bill and he’ll probably lose a few teeth. Your dog’s nails also need to be clipped regularly, and here’s how to do it. How often depends on how fast they grow and how much time he spends on surfaces that grind them down naturally. If you can’t bear to clip little BooBoo’s nails yourself, consider making a standing appointment with a groomer or veterinarian who will do it for you. You’d be amazed at how often dogs develop serious paw problems from nails that have grown too long. Remember: Don’t fight tooth and nail to avoid cleaning those teeth and clipping those nails. You and your dog just need to learn to deal with it. You’ll be happy you did. I’m perpetually surprised by how many dog guardians think crates are an invention of the devil. If you’re one of them, here’s what you’re missing in the equation: your Canis lupus is by nature a den dweller, and a crate affords you the opportunity to work with your pup’s natural desire to seek out small, dark, safe spots to inhabit. This can be a huge win for you, as well as him, if you need to housetrain the little fellow, not to mention for car or plane travel, or overnight stays with friends, family, or at a pet-friendly hotel. Remember: Crate hate is not logical, unless an animal has been emotionally traumatized by people who made bad choices with a crate. Try to keep an open mind. Talk to some dog loving friends who’ve crate trained their pups. Chances are they’ll tell you their dog seeks out her crate on her own for naps, at bedtime, and whenever she just wants a little me time. Firecrackers, thunder, and other loud, out-of-nowhere sounds often leave dogs frightened and wanting to flee to a safer place. These types of fears may develop even if your dog has had no traumatic experiences associated with the sound. Many fear-related problems can be successfully resolved. If left untreated, however, your dog’s fearful behavior will probably get worse. The most common behavior problems associated with fear of loud noises are destruction and escaping. When your dog becomes frightened, she tries to reduce her fear. She may try to escape to a place where the sounds of thunder or firecrackers are less intense. If she feels less afraid by leaving the yard or going into a certain room or area of the house, then the escape or destructive behavior is reinforced because it successfully lessens her fear. For some dogs, just the activity or physical exertion associated with one of these behaviors may be an outlet for their anxiety. Unfortunately, escape and/or destructive behavior can be a problem for you and could also result in physical injury to your dog. Your dog may also begin to associate a particular startling noise with other things in her environment, and she may grow afraid of these other things because she associates them with the loud noise that frightens her. For example, dogs who are afraid of thunder may later become afraid of the wind, dark clouds, and flashes of light that often precede the sound of thunder. Dogs who do not like the sound of firecrackers may become fearful of the children who have the firecrackers or may become afraid to go in the backyard, if that’s where they usually hear the noise. Create a safe place for your dog to go to when she hears the noises that frighten her. But remember, this must be a safe location from her perspective, not yours. Notice where she goes (or tries to go) when she’s frightened. If possible, give her access to that place. If she’s trying to get inside the house, consider installing a dog door. If she’s trying to get under your bed, give her access to your bedroom. You can also create a “hidey-hole” that is dark, small, and shielded from the frightening sound as much as possible. Encourage her to go there when you’re home and the thunder or other noise occurs. Consider using a fan or radio near the spot to help block out the sound. Feed her in that location and help your dog associate that spot with other “good things” happening to her there. She must be able to come and go from this location freely. Confining her in the “hidey-hole” when she doesn’t want to be there will only cause more problems. The “safe place” approach may work with some dogs, but not all. Some dogs are motivated to move and be active when frightened and “hiding out” won’t help them feel less fearful. This method works best when your dog is just beginning to get anxious. Encourage her to engage in any activity that captures her attention and distracts her from behaving fearfully. Start when she first alerts you to the noise and is not yet showing a lot of fearful behavior, but is only watchful. Immediately try to interest her in doing something that she really enjoys. Get out the tennis ball and play fetch (in an escape-proof area), or practice some commands that she knows. Reward her with praise and treats for paying attention to the game or the commands. As the storm or other noise builds, you may not be able to keep her attention on the activity, but it might delay the start of the fearful behavior for longer and longer each time you do it. If you can’t keep her attention and she begins acting fearfully, stop the process. If you continue, you may inadvertently reinforce her fearful behavior. These techniques must be implemented very gradually, and they condition or teach your dog to respond in non-fearful ways to sounds and other stimuli that have previously frightened her. Be careful using behavior modification: If these techniques aren’t used correctly, they won’t be successful and could even make the problem worse. Begin by exposing your dog to an intensity level of noise that doesn’t frighten her and pairing the noise with something pleasant, like a treat or a fun game. Gradually increase the volume as you continue to offer her something pleasant. Through this process, she’ll come to associate “good things” with the previously feared sound. Play the tape at such a low volume that your dog doesn’t respond fearfully. While the tape is playing, feed her dinner, give her a treat, or play her favorite game. Continue increasing the volume through many sessions over a period of several weeks or months. If she displays fearful behavior at any time while the tape is playing, STOP. Begin your next session at a lower volume, one that doesn’t produce anxiety, and proceed more slowly. For some fears, it can be difficult to recreate the fear stimulus. For example, thunder is accompanied by lightning, rain, and changes in barometric pressure; your dog’s fearful response may be to the combination of these things and not just the thunder. You may need professional assistance to create and implement this kind of behavior modification program. Medication may be available which can help reduce your dog’s anxiety levels for short time periods. Your veterinarian is the only person who is qualified and licensed to prescribe medication for your dog. Don’t attempt to give your dog any over-the-counter or prescription medication without consulting your veterinarian. Animals don’t respond to drugs the same way people do, and a medication that may be safe for humans could be fatal to your dog. Drug therapy alone won’t reduce fears and phobias permanently, but in extreme cases, behavior modification and medication used together might be the best approach. Do not attempt to reassure your dog when she is afraid. This may only reinforce her fearful behavior. If you pet, soothe, or give treats to her when she’s behaving fearfully, she may interpret this as a reward for her fearful behavior. Instead, try to behave normally, as if you don’t notice her fearfulness. Do not put your dog in a crate to prevent her from being destructive during a thunderstorm. She’ll still be fearful when she’s in the crate and is likely to injure herself, perhaps even severely, while attempting to get out of the crate. Do not punish your dog for being afraid. Punishment will only make her more fearful. Do not try to force your dog to experience or be close to the sound that frightens her. For example, making her stay close to a group of children who are lighting firecrackers will only make her more afraid, and could cause her to become aggressive in an attempt to escape from the situation. These approaches will fail because they won’t decrease your dog’s fear. Merely trying to prevent her from escaping or being destructive won’t work, either. If your dog is still afraid, she’ll continue to show that fear in whatever way she can — whether by digging, jumping, climbing, chewing, barking, or howling. Finally, know that formal training won’t make your dog less afraid of thunder or other noises, although it could help boost her general confidence. If your dog has severe fears and phobias and you’re unable to achieve success with the techniques we’ve outlined here, you should consult with an animal-behavior specialist and your veterinarian. Adapted from material originally developed by applied animal behaviorists at the Dumb Friends League in Denver, Colo. All rights reserved.